You do your work as a photographer and everything becomes past. Words are more like thoughts; the photographer’s picture is always surrounded by a kind of romantic glamor – no matter what you do, and how you twist it. I always say that I don’t want to be sentimental, that the photographs shouldn’t be sentimental, and yet, I am conscious of my sentimentality. 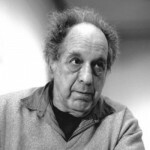 Robert Frank, is an important figure in American photography and film. His most notable work, the 1958 photobook titled The Americans, was influential, and earned Frank comparisons to a modern-day de Tocqueville for his fresh and skeptical outsider's view of American society.